Pepsi is winning the soda -- or pop for you Midwesterners -- war on Wall Street. Shares of Pepsi (PEP) hit an all-time high Thursday after the soft drink and beverage giant reported third-quarter earnings that blew away forecasts thanks to strong demand in emerging markets. The company also boosted its earnings outlook for the year. Top rival Coca-Cola (KO) hit a new record as well Thursday. But Pepsi's stock is up 14% this year compared to just a 7% gain for Coke. There are a couple of reasons to explain why this is the case. 1) Pass the chips. Pepsi benefits from owning the Frito-Lay snack business -- Doritos, Cheetos and Sun Chips as well as Fritos and Lay's. Revenue and operating profits from Pepsi's food business in North America and Latin America grew at a higher rate in the third quarter than sales and earnings for Pepsi's American beverage unit. It's no secret that soft drinks loaded up with high-fructose corn syrup are falling out of favor as Americans grow more health-conscious. 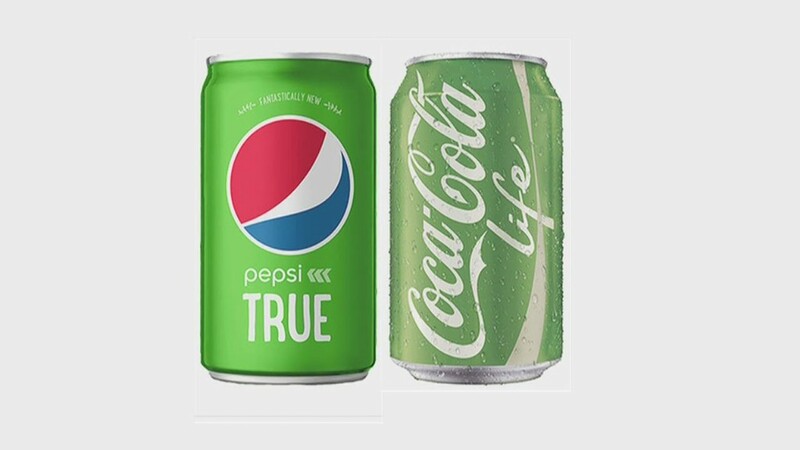 That's why Pepsi and Coke have both launched products with natural sweetener stevia in them ... and in hideous looking emerald green cans to boot. But it may be more crucial for Coke to succeed with lower-calorie sodas. That's because Coke doesn't own a food division. So it's trying to diversify beyond soft drinks with investments in other beverage companies, such as K-Cup coffee maker Keurig Green Mountain (GMCR) and energy drink producer Monster Beverage (MNST). 2) The Peltz effect. Activist shareholder Nelson Peltz, who is now arguably more famous for being the father of "Transformers: Age of Extinction" star Nicola Peltz than anything he's done as a corporate raider, wants Pepsi to pull an HP (HPQ) and eBay (EBAY) and break up into two companies. Peltz has repeatedly maintained that Pepsi would be better off with one separate public company for beverages and another for its snack business. But Pepsi CEO Indra Nooyi has rejected the idea. Now we have a chicken/egg question here. Peltz would probably argue that Pepsi is at an all-time high because investors are siding with him and think a split would be a good idea. In other words, expectations of a break-up are pushing the stock higher. Pepsi would clearly counter that the company's fundamentals speak for themselves. Either way, the possibility of a Pepsi split is something that the market is aware of and may be pricing into the stock. That gives Pepsi a leg up on Coke. Nobody is calling for Coke to be broken up. 3) Pepsi is cheaper. 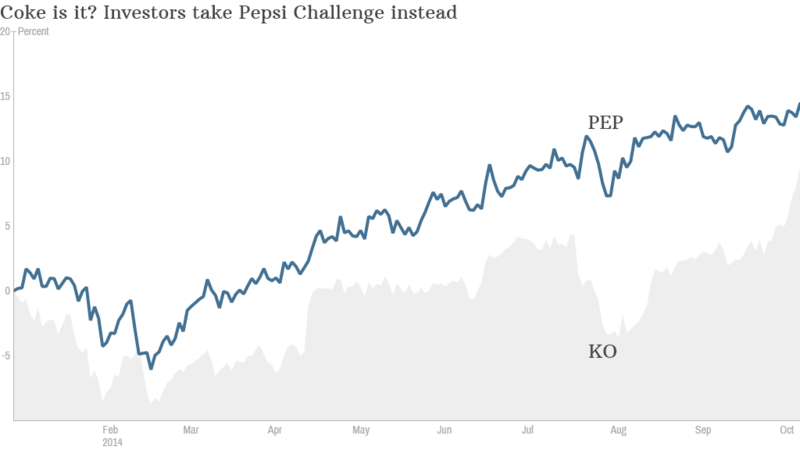 Pepsi is trading at 19 times 2015 earnings forecasts. And analysts are expecting earnings to grow about 7% a year annually, for the next few years. Now is that a little too expensive for a stodgy consumer stock? Perhaps. Still, Pepsi is more attractive than Coke. Although Coke trades at just a slight premium to Pepsi -- 20 times 2015 earnings forecasts -- its profits are only expected to increase 4.6% a year for the next few years. If anything, Pepsi should command the higher price-to-earnings ratio. Both stocks also offer a dividend that yields 2.8%. So it's not as if Coke is a safer haven than Pepsi. Coke will have a chance to prove that it deserves a richer valuation than Pepsi when it releases its results on October 21. But here's a fun closing factoid for all you soda junkies. The best performing beverage stock (and the one that makes the best products IMHO) is actually Dr Pepper Snapple (DPS). Shares of "The Doctor" are up nearly 35% this year. It hit an all-time high on Thursday too. Its shares are also cheaper than Coke and Pepsi and its earnings growth is expected to outpace Coke and Pepsi. Reader Comment of the Week! Apple (AAPL) is holding an event on October 16. It will probably be unveiling a new line of iPads and Macs and not a new iBuyback. Sorry Carl Icahn! But a follower of mine going by the handle of @DrugstorCowboy (who strangely has a picture of Gort from "The Day the Earth Stood Still" instead of Matt Dillon) had a much cooler, retro idea. "RE: Apple invite - my goofball theory is they're bringing back the Apple IIe!!! Okay, I'll stop now." That would be awesome. Or maybe they'll bring back the Newton? And now I'll stop.